For some of us, there is nothing more satisfying than making a tidy, well thought out to-do list. Well, actually, there IS something more satisfying—marking that to-do as “completed.” But that list, as helpful as it is, does have parameters if you want it to be most effective in your time management efforts. 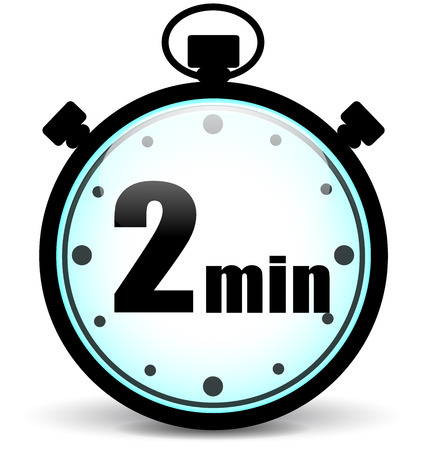 An important parameter is the Two Minute Rule. Let’s jump into that rule now (so I can mark it off my to-do list). David Allen, time management consultant and author of the best-selling book, Getting Things Done: The Art of Stress-Free Productivity, coined the Two Minute Rule and has explained that, “If you determine an action can be done in two minutes, you actually should do it right then because it’ll take longer to organize it and review it than it would be to actually finish it the first time you notice it.” What Allen underscores is that you must ask yourself, “What is the next step?” with this project, task, request, etc. If “what next” is a two minute or less task, take care of it right then. Email management is rich with opportunities to use the Two Minute Rule. Why start with email management? Love it or hate it, and despite the fact that with social media and instant messaging we have alternative ways to communicate, email as a mode of communication isn’t going anywhere anytime soon. According to one study, by the end of 2019, the average business is expected to send and receive 126 emails per day. And yet, the research suggests nearly 2/3 of the emails in the average inbox are not important. So, the key is to filter through the noise to get to the 1/3 you need. Before we go further, let me share a suggestion I pass along to all my clients, TURN OFF THE NOTIFICATIONS on your desktop and laptop. Researchers have found it takes an average of 64 seconds to recover from an email interruption and return to work at the same rate as before the interruption. At 126 emails a day, those 64 seconds add up. The same holds true for text messages, but I know many of us need to keep text alerts on for family emergencies. Facebook? No need to be notified each time a friend posts a favorite cat meme. So, I recommend you set aside some time in your day to address your emails. For many, the best time to process email is not right at the beginning of the day—save that time for your most important tasks—and not at the end of the day—you need to have time to address those items that need to be addressed before you leave the office. Try 10 a.m. and 4 p.m. When you do sit down to process the email, keep the Two Minute Rule top of mind and ask yourself, “What is the next step with this?” Can you compose a quick thank-you note in two minutes? Attach a file a subordinate or coworker needs to complete their part of a task? Answer a question from a colleague? Accept an invitation? Do it then, don’t mark it down as a to-do. But if you receive an email asking for a larger task, mark THAT down on the to-do list and save it for the time when you are able to focus, interruption free. You’ll complete the task more quickly and will likely have a much better, finished product because your mind will stay focused exclusively on the task. No need to stress about the task before it is complete. You’ve got it on your list and you know you’ve got the time cordoned off to finish the task interruption free. Got it? Try applying the Two Minute Rule over the next few days. You can start here and now. What’s your next step? Keep focused and you’ll find your to-do list may shrink, but you certainly won’t find a dip in your productivity.